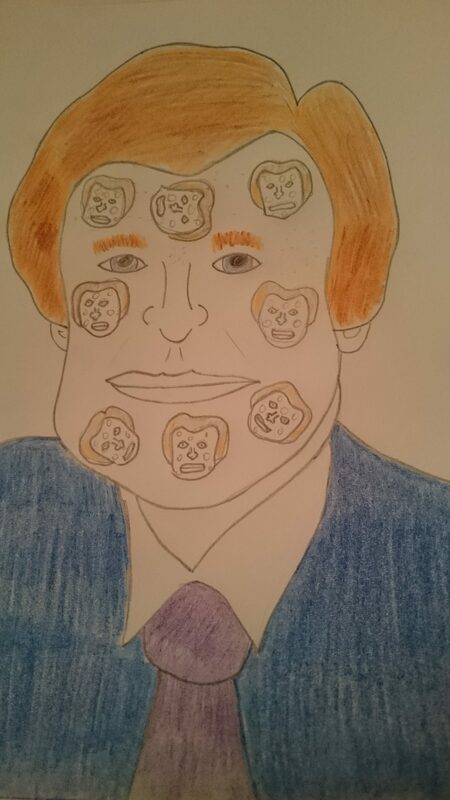 Following the recent startling relevation that former news reader Nicholas Witchell is a decent guy who will allow himself to be winched into a sewer to check on the wellbeing of a former 80’s puppet celebrity, it was also revealed the unique complexities of his complexion. Nicholas Witchell’s face contains smaller versions of his face, and on each of those faces is another collection of faces. It has not been checked thoroughly but scientists have theorised that the “face phenomena” could go on forever. It could easily rival the ever-expanding universe as the thing that nobody can really comprehend fully because if you did you might hide in a yurt and eat tv guides due to the fact that you’d lost you mind. This highly scientific study happens to include the most moving portrait of a newsreader I have ever seen, and I have therefore placed a £5 bet on it winning BOTH the Nobel Prize for Physics and the Turner Prize at my local bookmaker and turf accountant. Thank you. I think it has turned out a bit more ‘Bo Selecta’ ish than expected, because of the large and curvy chin, but overall I am so satisfied I am going to tilt my head and squint with delight. You should enjoy an exceptionally luxurious angle of tilt and a very long, satisfying squint. You’ve earned them. I expect it’ll just be like looking into a mirror for him. Like a mirror, but more beautiful. That’s what your artwork is. Do you think I can request an audience with him solely based on this magnificent piece of artwork? Not in a pushy pushy kind of way but in a way where I’ve earned it because it’s that good? Definitely. But I also think that you should ask him for it yourself and that I should not in any way be associated with you. You are not associated with me in the slightest. There’s definitely more me in me than there is you in me. I’ve never seen any less of you in a person than me. You’re right, I think you SHOULD do your own picture of Nicholas Witchell and we can present them at the same time. No. No, that’s not what I want. That’s the opposite of what I want. You’re not listening to me. You’re usually such a good listener. I am to listening what Kev is to Pouring Beans posts. I don’t think he’ll be reading this thread for a while so you might want to reel off another couple of zingers in the meantime.